Bradley S. Karoleff and John J. Kovach Jr.
Actual size of book - H 11 1/4" x W 8 5/8 "
Comments: This book is out of print and somewhat difficult to locate! This extraordinary book, Early Quarter Dollars of the United States Mint 1796-1838, by Rory R. Rea, Glenn Peterson, Bradley S. Karoleff and John J. Kovach Jr. is printed on high quality polished paper and loaded with photographs. I applaud these fine authors for all the hard work that went into publishing this book that is loaded with extensive detail and information on the Bust quarter series. first published in 2011-04-18, U.S. Collectibles section of Coin World. 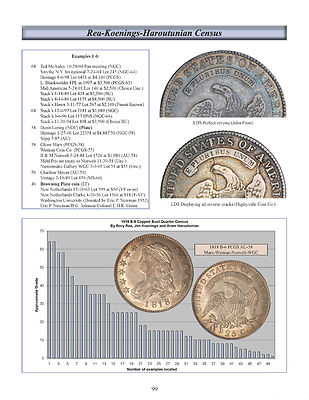 "The first comprehensive reference on early United States quarter dollars in nearly nine decades has been released with the publishing of Early Quarter Dollars of the United States Mint 1796-1838 by Rory R. Rea, Glenn Peterson, Bradley S. Karoleff and John J. Kovach Jr.
Carl R. Herkowitz contributed a biographical sketch on Ard W. Browning, author of the seminal work, Early Quarter Dollars of the United States 1796-1838, published in 1925. Browning’s book was the last major reference published on the subject. The new 8.75-inch by 11.25-inch, hardcover reference represents roughly a decade of extensive research by the authors. All of the photographic work is by Rea, who captured images of many of the finest known examples of Draped Bust and Capped Bust quarter dollars known to exist. Included with the presentation of each set of photographs are quick attribution tips to assist collectors in rapidly identifying the die marriage of their quarter dollars. The individual attribution guides with thumbnail illustrations are accompanied by detailed obverse and reverse die diagnostics. The die marriages are listed by the Browning attribution numbering system. The authors of the new reference have also included historical vignettes of national and international importance to put the issuance of the coins into perspective. Each die variety includes full obverse and reverse images, images of die states and rarity comments. In addition, the book offers a mintage table that includes reported mintages by date, known die marriages by date, and average number of coins per die marriage. Also included are known pedigrees of the top examples by grade. Illustrative color plates of pedigreed pieces from the census include identification of whose collection holds a particular coin, along with auction appearances, if applicable. An overall introduction is the work of noted collector and numismatic researcher John McCloskey. Karoleff comments on the E and L counterstamps on some 1815 and 1825 Capped Bust quarter dollars. Also included is detailed information surrounding discovery pieces. 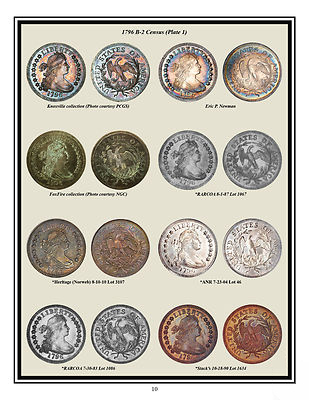 Draped Bust and Capped Bust quarter dollar errors and counterstamped pieces are illustrated and discussed in separate chapters. Also listed are quarter dollars that are part of the National Numismatic Collection at the Smithsonian Institution’s Museum of American History, as well as early quarter dollars within the holdings of the American Numismatic Society".